You know, I—I was telling the boys a while ago coming over, I said about how we must be happy all the time. God don't want you to be sad. You know what ill temper does? And that old temper, that's one of the awfulest old things. And it—it's about sixty percent of the cause of all sickness is temper. Yes, sir, them tam—tantrums you fly loose, remember, you just developing a cancer, ulcer, or something like, when you do it. When you get all stewed up about somebody, "I won't go back there any more. Wait till I give them a piece of my mind." All right. Remember, you're the one's going to pay for it. Just keep happy. The little story, said there was a little robin one morning, setting up on a limb, whistling over to his little mate. The little mate flew down by him and said, "You know, I'm so—I'm so worried this morning about one thing." Said, "What?" 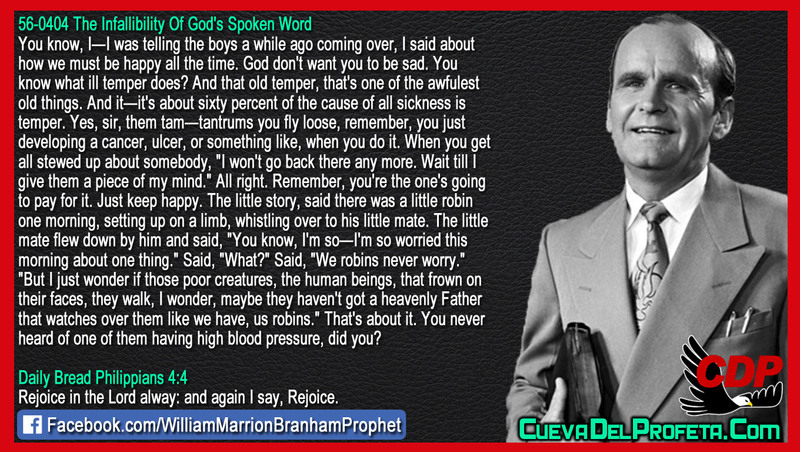 Said, "We robins never worry." 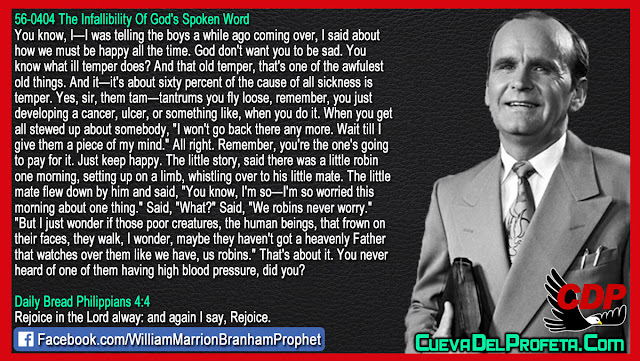 "But I just wonder if those poor creatures, the human beings, that frown on their faces, they walk, I wonder, maybe they haven't got a heavenly Father that watches over them like we have, us robins." That's about it. You never heard of one of them having high blood pressure, did you?